Want your business to look great? First impressions are everything if cliches are to be believed, but experience tells us the quality of services and products is the heart of successful businesses. As a business operator you're focused on providing services and solutions you can be proud of - but do you present them in a way that communicates how great they really are? Don't let less-than-professional design cheapen your company's appeal - Present your business with the same pride you have for goods and services you provide. How do you communicate your businesses strengths? Put yourself in the shoes of a potential client for a moment - now imagine the impression your current website, brochure or advertisement gives them. Has it sparked a positive reaction? Does it stand out from the competition? Is it presented in a way that makes you the first option? At Aeon Design we take all of these things into account when developing our clients brands and in creating printed media and websites for them. Our design process goes beyond creating an eye catching template, we go deeper looking at printing methods, advertising placements and strengthening your message to get it noticed. Aeon Design is a small business and recognises the challenges owner-operators have when it comes to marketing and advertising. We're proud to work for small businesses, we feel it's where we can be of the greatest benefit. We love working with like-minded people and it's our belief that people who choose run their own business do so because they're passionate about the services and goods they provide. We're certainly proud of the service we provide our clients and we're more than happy to provide you with our special brand of service. Give us a call or email to arrange an obligation free consultation and find out what we can do for your business. 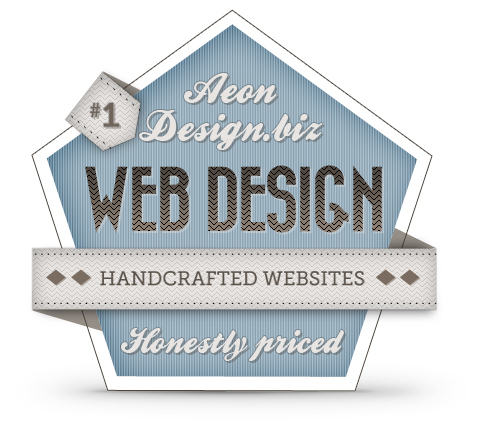 It's the combination of Graphic Design, Web design and Photography that separates Aeon Design from others. When creating an overall visual design for clients we can draw upon these to create a cohesive final solution. Having all of these services from one agent is not only beneficial to the overall design but it's also far more efficient for customers. or view some of our recent work here.